Financial Independence:Insider Secrets to Financial Success! "If you don't owe anything to anyone, and intend to remain debt-free, you probably don't need to read this book ..."
Insider Secrets to Financial Success! "Brilliant!" This is the best education that anyone interested in getting ahead financially could want! It's easy to understand and the principles are all very sound and easily implemented. Now I recommend this brilliant resource to all my clients to read. "Love This Book" I always thought that planning ahead meant sacrificing my lifestyle now to get what I wanted later. Thanks to this book I now have a clear plan for my financial future - and I'm not doing without anything in the meantime. I love this book. Thank you. Did you know that 93% of the Australian population will rely on family, friends and welfare to survive in their retirement? If that's not shocking enough, consider this. In the current economic environment, all of those 'resources' are now highly questionable! If your children are struggling from pay cheque to pay cheque, how will they support you? How much longer can welfare be provided in amounts sufficient to feed, clothe and house the 93%? No-one wants to be in the 93%. No-one has to be. There is a better way. This book has been written to help people realise their dreams and financial goals and to face up to the biggest hurdle confronting us all - financial independence ... today and in retirement. Written in plain English, the book begins by taking a look at the psychology of success. After all, no amount of enlightenment or careful financial planning will make you a winner if you cannot first see yourself standing in the winner's circle. You will learn about the four steps which make up the financial planning process and follow through step-by-step with worksheets and planners designed to make the job a whole lot easier. You'll also find an array of extremely useful forms and templates (you're guaranteed to use) in the final chapter of the book. Look no further if you need to complete your Will, a Statutory Declaration, your home inventory . . . . . . . . . and of course, we've included your own calculator and a calendar to make your planning even easier. While often simplistic, the Authors' thought-provoking style is aimed at telling you the things that no-one bothered to tell you before. In a language that you will understand. In short, this book will help you to plan your finances so that your money will work for you, rather than you working for the money. And it never loses sight of the fact that every one of us is entitled to some lifestyle along the way. So, if you want to be in the seven percent of Australians that succeeds in financial security, you must take action now and begin to find success within yourself. Lack of time, knowledge or a desire for freedom are no longer reasonable excuses to put off planning your finances - it is time to get smart and get educated. The first step for you to take is to download your copy of Financial Independence today. Try it for 90 days RISK FREE! If, for any reason, at any time within 90 days of purchase, you are not completely satisfied with this superb information resource, we will cheerfully refund 100% of your money. No questions asked. That's how confident we are that you will LOVE THIS eBOOK! We are also offering a special extra bonus for all customers for the whole month of ... customers who order and download their copy of Financial Independence any time this month will also receive a special extra bonus ... but more about that later. and you'll get a special extra bonus ... plus you'll save 50% on our regular price! Important Note: When you download your copy of Financial Independence eBook you will get unlimited access to the all of the following priceless information and powerful financial tools that you can use on your computer immediately. Insider Secrets to Financial Success. over 100 pages crammed with extremely valuable information - all critical to your financial success. a great range of legal and other templates that you can use immediately ... including Last Will & Testament and Enduring Power of Attorney templates. a whole bunch of forms & other fabulous tools to help you monitor your progress. Making informed financial decisions just got a whole lot easier! Download this fabulous suite of 15 easy-to-use financial calculators ... and take the guesswork out of planning your financial success! Here's what you will get. 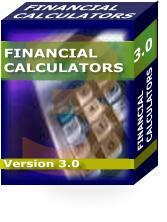 Financial Calculators 3.0 is a BRAND NEW PRODUCT and it retails at $39.90. But you get it ABSOLUTELY FREE when you download your Financial Independence eBook. Feel free to click here to visit the promotional website for this excellent new product. Bonus #2 - (for the month of only). It's an ancient question which boasts answers in almost every corner of knowledge and experience. Here you'll get the inside information that may just give you what you need to be one of the minority! Bonus #3 - (for the month of only). At any time in history, no matter what the state of the economy, irrespective of current trends, unemployment levels or where interest rates lurk, some money-saving tips stay true. Bonus #4 - - (for the month of only). Being free of debt is an important part of achieving financial independence. Jeremy takes you step-by step through the process of how to become debt-free and, importantly, how to stay that way. And remember, my 100% full satisfaction money-back guarantee means you buy risk free ... because I take all the risk!